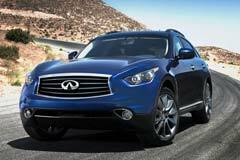 The Infiniti FX is described as being a crossover that has no compromises. This is mainly because the Infiniti FX couples up the best of a luxury crossover SUV with the features of a rather compact vehicle. Yet, it offers plenty of leg and headroom. Buying a used Infiniti FX is the choice of many, both those who want a luxurious and heavy-duty vehicle, and also those who need a relatively spacious family car. The first generation of this model was introduced in 2003. The look of the Infiniti FX is stylish and dynamic. Its performance reports on its standard 3.7 liter V6 engine are very good. It is described as being very responsive in various regards. The trunk space is not as large as many may wish for and there are many SUVs which have a larger trunk. Other than that, though the interior of the Infiniti FX is practical and quite comfortable.